Born in Austin and raised in Buffalo Gap, Tiffany Harelik is Texas to the bone. The former Sweetwater Rattlesnake Round-up Queen has explored the world over, capturing backstories from the backcountry and recipes from the range in efforts to preserve the culture of outdoor cuisine. 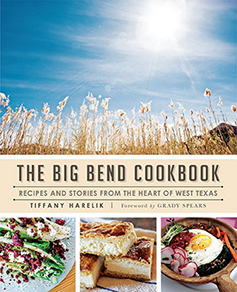 From her first project, The Trailer Food Diaries Cookbook Series, to her recent Big Bend Cookbook and Terlingua Chili Cookbook, Tiffanys books combine a quirky cast of characters with heirloom recipes in her trademark anecdotal style. The Big Bend Cookbook is a lush love letter to the remote and wildly beautiful region in southwest Texas. Author Tiffany Harelik has put together a gorgeous collection of photographs, facts, personalities, and recipes. Photographs showcase natural vistas, flora, and fauna; others highlight regional murals and signs. Harelik has included both historical and contemporary photographs of people and places, adding more depth and interest for the reader. Of course, there are the requisite colorful and mouth-watering snapshots of food (you couldn’t have a cookbook without those!). Most of these are interspersed with historical and geographical facts about all the different places in the region. Many of the stories share glimpses of the different people who chose to call the Big Bend area home at one time or another. They came from faroff places like Scotland, Belgium, California, and Rhode Island. We also meet the very colorful Harold Cook, a political analyst originally from Houston who knew political columnist Molly Ivins. In fact, his Marathon home is built on property once owned by the late, legendary Ivins. Then there’s Glenn Moreland, a chuck wagon builder and cook, and director of the American Chuck Wagon Association. He has many stories of chuck-wagon cooking competitions and experiences, including cooking for actor Tommy Lee Jones. The recipes in this book are as varied as the people who contributed them and shared their stories. There are Texas classics like chili, chicken fried steak, cabrito (goat), and brisket. You’ll also find recipes that reflect the adventurous spirit of the contributors, such as Crispy Fried Brussel Sprouts Haystack, Bibimbap with Ghetto Gochujang (a Texas take on the Korean classic), and Jalapeno Chocolate Cake. Harelik also includes recipes featuring regional ingredients like Mesquite bean flour, Prickly Pears or tunas (the fruit of the Prickly Pear cactus) and nopales (the green pad of the cactus). The book is also very practical. Harelik has included sections about what to do in the Big Bend area, foraging for native and wild ingredients in the region, camping and hiking, and wildlife and hunting. I really enjoyed and appreciated the tips about where to eat, must-see sights, and popular activities the author included in each chapter focused on the different communities in the region. The Big Bend Cookbook is a community cookbook at heart in a beautiful package.